https://sep.yimg.com/ay/yhst-33477391359232/black-tang-zebrasoma-rostratum-longnose-surgeonfish-5.jpgBlack Tang - Zebrasoma rostratum - Longnose Surgeonfish Expert Only!!! Not Cover Under Arrive GuaranteedSemi-aggressive75 Gallon9.4 inchesYes, with CautionHerbivore, Greens, Pellet, FlakeHawaii, Christmas Islands Small 1" - 2"
One of the least collected fish in the hobby, the Black Tang is often seen as a centerpiece fish to complete a show aquarium. 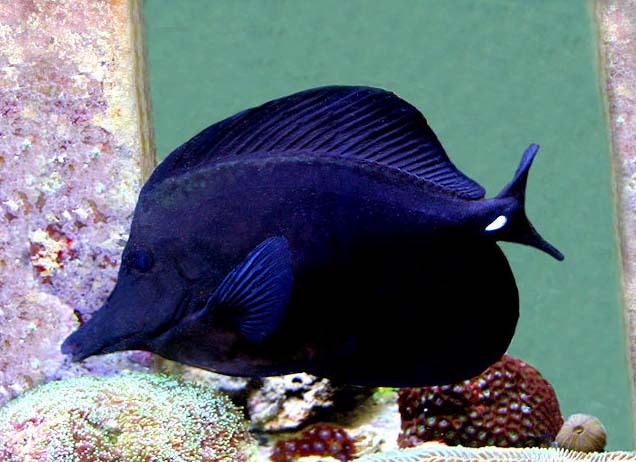 The Black Tang is as easy to keep as the other fish in the Zebrasoma family with the exception of specimens occasionally having problems with nose damage. They will spend their day picking at rockwork and occasionally sand in search for hair algae to eat. This Black Tang is about five to eight inches in length. A 100 gallon or larger aquarium provides a good environment for these Black Tang. The Black Tang should ideally be kept in temperatures between 72 and 78 degrees Fahrenheit. A pH value of 8.1 or 8.4, and a specific gravity of 1.020 to 1.025 should be maintained. When kept with invertebrates, the specific gravity range should be 1.020 to 1.025, for the invertebrate species. In a fish only aquarium, the specific gravity should fall between 1.020 and 1.023. In the wild, Tangs spend their entire day swimming around on the reef in search of marine algae and meaty bits of food they can find. It is recommended to feed dried marine algae (Nori), Spirulina Flakes, and frozen mysis shrimp. Tangs quite easily adjust to captive diets and will eventually eat flake and pellet foods as well. It is recommended to soak flake food in some type of vitamin supplement like Selcon or a garlic supplement in order to help the fish fight off any possible parasite infestation and offer balanced nutrition.